Can you imagine going to see David after he had been to battle with Goliath? He would tell the story of how the giant fell and Israel was released from oppression and fear because of what God did. The defeat of Goliath is what we might call “the title bout.” The heavyweight fell, and David became the world champion. Before this major bout, though, he had many little bouts on his way to face Goliath. If we look closely, we will be able to see David and the little giants. We will learn that men do not win or lose with the big giant; men win or lose with the little giants. David would have never made it to Goliath had he not first won the battles against these little giants–giants that all of us sooner or later must face for ourselves. But David went and returned from Saul to feed his father’s sheep at Bethlehem. And the Philistine drew near morning and evening, and presented himself forty days. And Jesse said unto David his son, Take now for thy brethren an ephah of this parched corn, and these ten loaves, and run to the camp to thy brethren; And carry these ten cheeses unto the captain of their thousand, and look how thy brethren fare, and take their pledge. 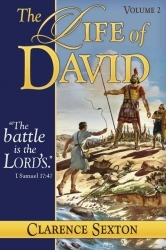 David fought the battle, “Will I obey my father?” It did not seem so important then. If we weighed the importance of the fight with Goliath with taking a bag of groceries to his brethren, the delivery of the food would not have seemed too important; but he would have never gotten to the fight with Goliath had he not obeyed his father. There is so much to be learned from following instructions. As long as we live, we are under authority. God desires the whole world to function on authority and submission to authority. David had an appointment not only to deliver the groceries but to hear the giant. It was ordained of God that he arrive at the camp of Israel at the very time the giant was doing his talking. Had he not gotten out of bed and gone when he did, he would never have heard the giant. David was disciplined. This discipline was rooted in the realization of his responsibility to God. God instructs us to live a disciplined life. Rules, regulations, and guidelines are set up so that eventually we will do what is right when no one is looking. Instead of fussing about these rules, we must submit to them and allow them to shape our character. The giant is taunting them. David happens to come on the scene when the giant is making his speech. This is the way God planned it. David was one of those people who saw a need and responded to it. I am glad that David pressed on though others did not. And David spake to the men that stood by him, saying, What shall be done to the man that killeth this Philistine, and taketh away the reproach from Israel? for who is this uncircumcised Philistine, that he should defy the armies of the living God? And the people answered him after this manner, saying, So shall it be done to the man that killeth him. David had a head-on collision with his oldest brother, Eliab. Eliab had been there the day Samuel came to Bethlehem and anointed David king over Israel. He was the oldest son. When Samuel saw Eliab, Samuel said within his own heart, “This must be the man.” But God said, “No, I don’t look on the outside. I look on the inside.” Eliab had faced the rejection of that day. He said to David, “You are nothing but a pipsqueak. All you do is take care of a few sheep in the wilderness. Your heart is full of pride. We are here to fight, and all you want to do is see the battle.” David loved his brother. When his brother said those things to him, it hurt him deeply. Many of us have had to deal with someone we love who does not approve of what we are doing for the Lord. This is one of our little giants. David answered Eliab, “What have I now done? Is there not a cause? And he turned from him toward another.” He first asked Eliab to explain what he had done wrong. Then David said, “Is there not a cause?” He was saying, “Isn’t there something that needs to be done?” Thirdly, he turned from his brother. David would have liked to have heard his brother say, “I believe in you, David. Go get him.” When his brother rejected him, even though it hurt him, David did not dwell on it. He went on with the work of God. That is what we must do. There was only one thing that enabled David to face the king of Israel and say, “I will not be discouraged by what you say.” Psalm 19 gives the secret of David’s strength. “Let the words of my mouth, and the meditation of my heart, be acceptable in thy sight, O Lord, my strength, and my redeemer” (Psalm 19:14). He had God’s Word in his heart (Psalm 119:11). Could it be that the reason we fall to so many little giants is because we have hidden so little of God’s Word in our hearts? There was something inside of David that made him a champion. We dwell too much on our obstacles and problems and too little on the indwelling Holy Spirit and how we can yield to God and to His Word and have the victory. Is there anything or anyone we must deal with that is greater than God? The Bible says, “Greater is he that is in you, than he that is in the world” (I John 4:4). Our victory is in Jesus Christ. As David talked to Saul, he added a little footnote after he made his speech. In verse thirty-seven he said, “The Lord that delivered me out of the paw of the lion, and out of the paw of the bear, he will deliver me out of the hand of this Philistine.” David did not match himself against Goliath. He matched God against Goliath. The Bible says that the weapons of our warfare are not carnal. What are our weapons? Ephesians 6 gives us our armor, and at the end of that armor lesson, it says that we have the Word of God and prayer. These are our weapons. Saul offers David his armor in I Samuel 17:38-39, but David chooses not to rely on Saul’s armor, saying, “I cannot go with these; for I have not proved them.” The Bible says in verse forty, “And he took his staff in his hand, and chose him five smooth stones.” A lot of people want to make a great deal out of the stones. The lesson is not in the stones; the lesson is that David took what God provided. What God provided was five stones. Do not try to explain away the miracle of David slaying Goliath. God sent the stone right through the helmet of brass and killed him. It was not David; it was the Lord. It was not David that could face his father and do right. It was not David that could face himself and get up. It was not David who could face others and go on and face his brother and keep moving. It was not David who could be tempted sorely with soldiers’ armor and reject it. It was God who enabled David to go fight those little giants, and it was God who enabled David to fight Goliath. God gave the victory, and God was glorified. The more we realize that we are nothing without the Lord, the better off we are going to be. David fought the little giants, and then he got to Goliath. The real victory is won or lost not with the enemy, but in our own hearts. What we do with God and God’s Word determines if we will have victory. 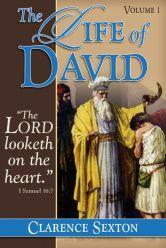 To learn more about how God used this young man after His own heart, please read my books The Life of David, Volumes 1 & 2. You may order a copy of these books by clicking on their image or by calling Crown Christian Publications toll free 1-877-AT CROWN (1-877-282-7696).